This photo was made possible with "The StickPic"
So last Thursday we loaded the Xterra down with our packs (packed) and headed off to Robinsville, NC. We had reservations for a night at the Microtel Inn and then the next morning we were off to Fontana Dam to start our hike! We got to Robbinsville, NC a little after 12:00 that night and quickly got checked into our room. When we arrived there were little snow flurries falling which had lightly dusted the tops of the houses and buildings as well as the cars parked for the night. But we were not worried…the snow was forecast to stick around just until morning time. So, we set the clock to wake us up at 6:25 am so we could all get showers, grab something to eat and drive to Fontana Dam. I wanted to get started with our hike around 9:00 so that we would have plenty of time to get to our campsite before sunset. When the alarm made its annoying sound just a few short hours later, I wanted to bounce out of bed, however, it took me a few minutes to get up and then a shower to get the bounce going! But then once I was good and awake, I was ready to go! I headed back and turned in and then drove to the parking lot which is above the “Fontana Hilton.” We parked and I headed down the hill to the restroom and met the first (thru) hiker. He was hiking up the hill from the Hilton and headed to the trail. After I used the restroom we drove across the dam and then took an immediate left. We headed up to that parking area thinking that this was the parking area at the trail head…but I couldn’t find the trail. So, I drove back to the dam and then noticed the road that kept going straight. I went back and picked up my wife and buddy and then drove down the little road to the end, which did in fact end at the trail! So, we got on the trail about 9:15 headed north on the AT. When we started out it was snowing pretty good but it didn’t stick around very long. Within the hour it was gone. At first, the trails were good and clear, but as we began to climb higher, we ran into some snowy patches along the trail. The snow was only about an inch or two at most and sometimes didn’t even cover the trail, but we were excited to see the snow! The snow on the ground and the lake down below us made for a very interesting hike. 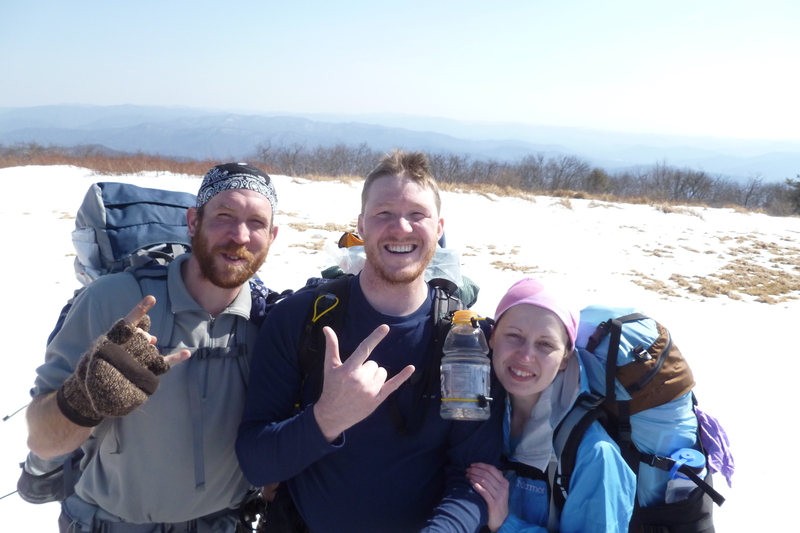 Also around this time, we met 3 other thru-hikers heading north. Life was good! Once we got closer to Shuckstack the climb got a little steeper, however, it wasn’t too bad. When we got to the top of Shuckstack we chose not to head up the side trail to the tower and decided to press on a little farther before we stopped for lunch. So, we did. As we began descending Shuckstack the snow began getting deeper on the trail and by the time we came to where Twenty Mile Trail intersected the AT we were kicking through drifts a foot deep! Once we turned down Twenty Mile Trail we began losing elevation quickly, as well as the snow covering the trail. Just before we came tot he intersection of Twenty Mile Trail and Twenty Mile Loop Trail we decided to sit down and have lunch next to a bubbling stream. It was great. After we ate we refilled our bottles and used Aqua Mira drops to clean our water and then pressed on. We crossed over 2 large streams on Twenty Mile Loop trail, the last of which was just before the intersection at Wolf Ridge Trail. Once we got on Wolf Ridge trail it was a short hike to our first campsite! We arrived at campsite a little after 5 pm, which gave us about 2 hours before sunset. We got our tents erected, collected water for cooking and then tried to gather some wood for a fire (all the wood was wet though). Just before sun set, 4 other hikers hiked in and set up camp at a site just above ours. We ate our dinner and fiddled with the fire for a while before calling it a night. As we made our way into our tents, we could hear the 2 large streams (one on each side of us) bubbling constantly, soothing us to sleep. And up in the sky, the moon didn’t offer much light, but the stars shone brightly and it was nice being able to sleep under them in such a beautiful area! The trail began a fairly steep ascent that was constant. About an hour after we started the temperatures were quite warm and I had already come out of my boggin and my R1 and was contemplating unzipping my pants legs, but decided to wait a little longer. Good thing too…just around a few more switchbacks we came back into a little snow on the trail. At first it was nice…the wind coming off the snow was cool and did well to cool me down, but, the snow was quickly getting deeper. Very soon we were hiking in snow about 4 inches deep and this made the already steep trail quite tiring. The views were still very pretty but we were quickly tiring out. It seemed we were taking twice as many steps as needed and working twice as hard to take them. In short, we were tired! I had plans of arriving at Campsite #13 at the intersection of Wolf Ridge Trail and Gregory Bald Trail by 12:30 and having lunch there or on top of Gregory Bald. However, when we strolled into campsite # 13 at 2:00 pm and then was told that the water source was about a quarter of a mile in a direction other than the one we were headed, we decided to pull off our packs and have lunch there. Troy and I headed down the trail with all of our water bladders and bottles with sore anticipation of carrying all this water down the trail, but wanted to be sure we had water when we needed it. Brandy stayed up at the campsite and pulled out our lunches and began pre-mixing the Aqua Mira drops. We met 2 hikers which were staying at campsite # 13 for the night and then just before we left, 3 other hikers hiked in from Gregory’s Bald. We talked with them for a little bit and then headed on, with concern that we may need to pull out our headlamps to make it just over 5 more miles to our next camp for the night. As we were headed up to Gregory’s Bald we met 4 more hikers hiking down, and then once we made it to the top of the Bald we met a group of 7 hikers. This was the most hikers we met in this amount of time. Just down the trail, the trail split with only a sign stating no horses allowed on the trail to the right. I immediately got concerned and pulled out my TI map rather than my print off I had been going by. After a little studying we decided it would be better to keep going down the trail that looked most used, and happily it turned out to be the right one! Also, the snow descending Gregory’s Bald had turned to a slush in the middle of the trail, made up of snow, ice, water and mud. It was a little slippery, but we began making a little better time that we had made coming up Wolf Ridge Trail. We had heard reports of snow drifts easily 1 foot deep along the AT, so we were a little worried. We arrived at the AT around 5:15 and only had 2.2 miles to go to the campsite. We were still pushing it a little with only 1 1/2 hours of sun shine left. We happily found that if there was much snow on the AT, it was mostly gone now. As we were hiking along we met 2 more hikers which were thru-hiking the Smokies AT section. After a quick conversation with them we trudged on…and finally arrived at the campsite at 6:25 pm. Campsite # 113 used to be the site of Birch Springs Shelter and now is a converted campsite, but it is not like the other campsites I have been to in the Smokies. There is actually tent pads made into the side of the mountain and has one designated fire ring for the entire camp grounds. We claimed the first empty pad we came too, but Troy still had to set his tent up in a semi-flat area on the side of the mountain (although, our “tent pad” was not to level either). We quickly set our tents up and by the time we were done it was dark. We luckily already had enough water to cook with since we lugged it all the way from campsite # 13 (5+ miles back) so we went ahead and got our water to boiling. There were about 8 other people camping among the other sites but we didn’t get to talk with them much since it was so late. I have posted all 141 pictures on my FaceBook page which can be seen here. This entry was posted in The Trail, Trip Report and tagged Appalachian Trail, AT, Backpacking, Campsite # 95, Campsite #113, Gregory Bald Trail, Gregory's Bald, GSMNP, Hiking, Shuckstack Mountain, Shuckstack Tower, Smokies, Smoky Mountain, Twenty Mile Loop Trail, Twenty Mile Trail, Wolf Ridge Trail. Bookmark the permalink. I’ve enjoyed going through your blog posts ever since a friend told me about your journey from heavy weight to light weight. Your post here on the Smokies trip reminded me of a “91 trip my brother and I took with another friend from Fontana Dam to Davenport Gap. We did the trip in the middle of Jan and had a great time overall, but the first part of the experience was when I started questioning the weight of my pack. I don’t remember exactly how much my pack weighed, but I know it was in the 50’s. Packs, clothing, basically all equipment were heavier then, but I knew there had to be options. Ever since, I have gone through the slow process of trimming down and find I enjoy the trips much more. I’ll continue to catch up on your posts and hopefully find you on the trail someday. That is great to hear that you have lightened up your pack too… it really does make the trips that much better, and what better place than to enjoy those trips than in the Smokies! It has been a while since I have been back, but every time I go, I love it. Thanks again, and happy hiking! Very cool Stick glad you had a great time out there. Freaky how the weather changed so radically as the hike went on! I got to get me out to those smokey mountains one of these days. Had a blast stick can’t wait till next time. stick, thank you for taking time to do these videos, brings back a lot of memories. Great videos! Now I’m all excited for my first trip of the season, and our first attempt at backpacking 😀 . Looks like you guys had a blast! I like the title of your blog too. When I started I thought nothing of weight, or at least not that much. My first pack weight was 56 pounds, and that was heavy but it didn’t stop me from having a great time. Nor did it stop me from picking up other items I found along the trail…but still I realized that with some thought and some more $$$ I could go lighter and be jsut as comfy, if not more. So, I set my goals to go lighter. And I have, my pack weight leaving out on our last trip was 25 pounds. Anyway, good luck on your hikes as well as your goals, but I would recommend not to get caught up in titles, but what works for you even if it is 3.6 oz heavier than the “UL” definition! Haha, that sounds like something my husband would say. I do tend to get oz counting crazy and he always reminds me that it doesn’t matter how much weight we save if we can’t actually use it. I recently had to rethink a tent I wanted because it was a weight savings of 6 oz but my husband would never have fit through the door. Sure it would have saved us almost half a lb, but poor hubby would have had to sleep in the vestibule! It’s always good to be reminded of that. But thanks to sites like yours and others, we are looking at a first trip pack weight of 25lbs and 30lbs skin out for two nights. Not as light as we’d like, but so much better than my first planned gear list back when I had no idea going light was an option. Thanks for the encouragement, I can’t wait to get out there and come back with some great memories and pictures!